What Causes Mold in a Crock-Pot? If your Crock-Pot or other brand of slow cooker has developed a layer or film of mold, or repeatedly grows mold on the foods inside of it, several problems may be responsible for this situation. 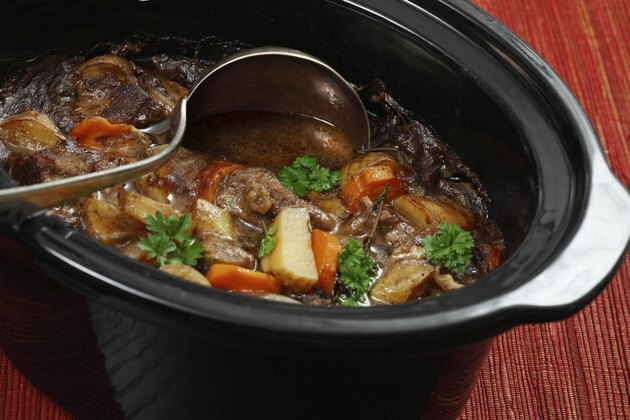 While Crock-Pots have been approved as safe for cooking by the United States Department of Agriculture, the care, cleaning and storage techniques used may cause harmful molds to grow. Thorough cleaning and maintenance of a slow cooker prevents mold growth. Moisture builds inside of the Crock-Pot as it cooks the foods. This is because the heat from the pot causes the water content, which is present in all foods, to evaporate as steam. That steam escapes if the pot is open, but many recipes call for a closed lid. Once the heat element is shut off, the moisture sits in the pot with the food, creating the perfect environment for mold to grow. Avoid this by removing the lid once the food is cooked and serving the food while it is still hot. Leftovers that are stored in a Crock-Pot rather than an airtight container may develop mold more quickly than those stored properly. Also, leftovers that are left longer than the shelf life of the prepared meal, even if refrigerated, grow mold when they begin to decompose. Refrigerators inhibit the growth of mold during the shelf-life of the food, only when the food is properly contained, but refrigerators are dark and damp, which provides a breeding ground for mold on any foods that begin decomposition. That same moisture present from cooking in the Crock-Pot stays with the food if the entire device, with food, is placed in the refrigerator, which could enhance the potential for moldy food. When you have finished cooking and serving foods that you prepared in your Crock-Pot, you need to wash the inner stoneware basin thoroughly with hot, soapy water. Failure to remove the traces of foods, meat juices and sauces can lead to mold growth; especially when you store the crock pot in a dark cupboard with food still on it. Even on your counter top, mold can grow over foods that you leave out for the night when the heating element is not on. This process happens more quickly during summer months, as warm air can speed the growth of mold. If you store your Crock-Pot when it is not in use for long periods of time, location is key to preventing mold growth. A dry cupboard or storage closet will keep it clean and dry as long as you have washed and dried it before storing it. A damp area, such as a basement or utility room, can expose the pot to added moisture and cause water to accumulate and develop mold. Get rid of mold in the cookware by first cleaning inside the stoneware vessel with warm, soapy water. Let the water sit for 10 or 15 minutes to loosen stubborn debris, then wipe it away with a sponge. Rinse it out. After the Crock-Pot stoneware portion is washed, sanitize it with a mixture of 1 teaspoon of bleach mixed into a gallon of water. Fill the crock with the solution and let it sit for several minutes, then dump the liquid out. Rinse the pot and allow it to air dry completely before storing it. Can Mold Grow in a Microwave? What Is a Self Basting Cast Iron?